Oh, please, elucidate. Enlighten and inspire me all at once! It was “activist” judges who installed Bush as president. Sorry Mark, but you are a victim of the corporate newsrooms who hide the real information from you in order to obey their masters who control all of our information. Your statement is partly true, in that it was the "activist" Florida Supreme Court that ruled that a statute governing when the election was to be declared didn't mean what it said. If they would have followed the clear law, there would not have been a need to go to the SCOTUS. Even there, the original ruling was 7-2 that the method of counting votes used by Florida was unconstitutional. The 5-4 ruling was whether or not to stop the unconstitutional counting. Your example demonstrated your point, but not in the way that you meant. It was the rejection of activism that disregarded the law that allowed Bush to retain his majority. This notion that the constitution is a static document that spells out how cases should be determined is utter fantasy. The constitution is a broad outline with a great deal of room for nuance and legitimate disagreement. The Constitution is the framework under which we have agreed to organize limited government for assistance in our affairs. To call it a living document is the same as saying that the wood that makes up the frame of a house is "living." Law provides its benefit by giving us a sense of certainty. If you go to a lawyer for advice, he or she may tell you that the law is clear, and that you will prevail or not. But if the law is nothing but nuance, everything becomes subject to litigation. And even if you lose, applying nuance would get you into the Supreme Court where the adverse ruling could be overturned. Of course, if you win, the other side could also apply nuance which would get you into the Supreme Court where the adverse ruling could be overturned. In other words, everything has to go to the Supreme Court for final determination, which just bogs down the Supreme Court, and provides no guidance on what the state of the law is except moment to moment. Applyng Obama's criteria of "empathy" to judging reduces all of the cases to passion plays. And with your background, I am surprised that you don't realize that the wealthy litigants would have the better supply of assets to sway the judge with emotional tugs at their heartstrings. Furthermore the founders were far from infallible (slavery, women voting, electoral college, appointment of senators). You are right that the Founders were far from perfect. No human endeavor is ever perfect. But what the Founding Fathers were was incredible. They managed to take 18th Century concepts and used them to create the most incredible document for self governance ever devised. And the most amazing thing is that they created the ability to modify it (slavery, women voting, appointment of senators for example). If you demand perfection, you will achieve it in that you will be perfectly disappointed. On top of that, societal values change - people are more accepting of gays now than ever before in history, and that should be reflected in court rulings. Yes, American societal values change, but that doesn't mean that the courts are the way to affect change. In fact, the activism of the California Supreme Court led to Proposition 8, which has set back acceptance of gay marriage by at least 15 years. Your lack of willingness to consider the legislative route to societal change reflects poorly on your belief in the essential ability of citizens to respond to societal changes. I hope that you will consider these points, and if I am wrong, I am willing to listen. But don't rely on common leftist dogma, use facts and real argument. What I came away from this interview was that for Democrats, Republicans are a bigger threat to the country than terrorists. At least, that is what I am sure that the political leadership in California is saying right now, what with their plebiscite on further confiscatory taxation being rejected so heartily. According to the old adage, "As goes California, so goes the Nation. That was certainly true in the '70s when Proposition 13 started a real revolt on taxes that swept across the country. You could even argue that they have paved the way for the mess we are about to enter with overspending and overtaxing. But it took California quite a while to get into this mess, and it was driven by politicians who promised all sorts of wonderful and happy programs that were all going to do so much good. I suppose the next step is for the wise solons of Sacramento to start slashing everything, which will then present the voters with the reality that there is no such a thing as a free lunch. You can't control spending and taxes and get every little nicety that appeals to you. Adults have to make choices, and the choices are often hard, but that is why they get to make them. Maybe the voters of California have realized that the promised Nirvana if they would just pay more is not going to come about. Just like we probably will realize in less than a year and a half on the national level. The problem to me though, is this a well thought out assessment of their situation, or a gut reaction to the idiots in Sacramento? Don't get me wrong, I concur with the results, but when you match up the sort of initiatives that get passed, you wonder if people really do understand them. For instance, in Montana we have passed an increase in the minimum wage that is paired with the CPI for increases, and expanded SCHIP to children of families making $50,000 a year. Leaving aside the merits of these proposals, fiscally speaking they are a disaster. Businesses are raising prices to make up the increase in wages, thereby reducing the value of the wage increases and children are being dropped from family health care plans to become covered by the state. I don't know what the answer is to my fellow citizen's inability to understand the complications of their choices. But maybe for a cynic, the answer is clear: Appeal to emotion and get your way (at least temporarily) and deal with the consequences later. Oh wait, that's just what is happening now. Now, what is he going to do about it, except make it worse? The ultimate in vacations. Be sure to click the "Read More" for the testimonials. This is not about the morality of "torture." This is about the cynical manipulation of the Left by politicians who are only interested in power, not the truth. Sen. Baucus' Finance committee is looking to remove the tax deduction that businesses get for providing health care in order to expand the Medicare\Medicaid provisions to more who are uninsured. What a wonderful idea, and I am sure that they have thought this all the way through of course. While I agree that giving employers a tax break has skewed the system to its present day unworkable mess, I think that their solution is going to make the situation even worse. If that is possible. If a business will lose the deduction that they get, less of them will offer health care. First off, it's expensive, and at a time like right now, it's not needed as an incentive to get workers to come and work for you. Second, if they tax the workers for the received benefit, how many are going to ask for the contribution in cash instead of insurance, and then not buy the insurance. Thereby raising the number of uninsured. That would be my personal preference of course, since I am covered by two plans that I don't pay for, nor do I use. Give the money to me, let me invest or save it, and when the time comes that I go to a doctor, I will negotiate the price I am willing to pay. But I know that the majority of people are not going to save it and instead will be showing up on the Emergency Room door with no insurance at all (the present situation, but there are going to be a heck of a lot more of them). So, what is the answer to the problem? Darned if I know, short of repealing the XIII amendment and forcing doctors to work for free. We have contrived such a monstrosity that the only answer may be to scrap the whole deal and start over. No insurance for anyone. Not much of a campaign motto though. 1. 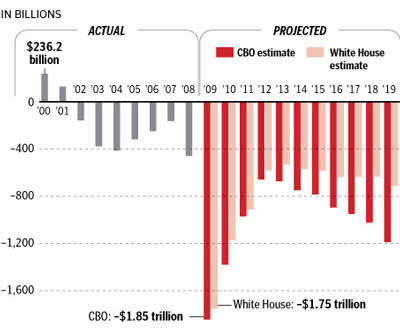 Quadruple the Deficit from 2008. 2. Have lower tax receipts. 3. Destroy the willingness of private investors to contribute to anything the government has an interest in. 4. Have the government borrow most of the available capital, thereby reducing the availability of business to borrow. 5. Destroy the American automobile industry by handing it to the UAW. 7. Ignore the continued corruption of many of the top Democrats. 8. Alienate the Left by continuing the same policies that Bush used. 11. Maintain high unemployment in non-government jobs. 12. Maintain a certain level of disdain for a significant portion of the electorate. 13. Increase the costs of energy. Of course, having all of these things come together at the same time is highly unlikely. Just as it is that Obama would actually do all of these things. While I realize that this is not much different from the old player pianos, this is still pretty cool. And I think that the graphic depictions of the notes makes more sense than standard musical notation. A Nation of Laws, or a Nation of Courts? President Obama makes much hay out of the idea that he is restoring us to a "Nation of Laws" at least in regards to how we treat those who are trying to kill us. All well and good of course, but apparently, that is the only place that laws would apply. If law gets in the way of a greater public good, well, we'll just get a judge to get around that problem. In other words, judges should decide cases not on the legal merits, but on the desired outcome. Kind of makes you wonder why we should even have any legislative bodies to pass laws doesn't it? who is going to buy bonds from unionized companies if the government is going to take their money away and give it to the union? We have just seen an episode of Gangster Government. It is likely to be part of a continuing series. Following it out to its logical conclusion, our entire governmental apparatus is going to be turned over to our wise jurists who will only use their enormous power for good, at least as they see it. Forum shopping just became a lot more attractive. Add in that if you are a private investor looking for a safe but low yield return for your retirement, are you going to invest in anything that the government will now say is not in the greater good? But in the auto case, by trying to reward the unions for all of their good and dutiful service in getting him elected, he may have just sown the seeds of their own destruction. Something very interesting is going on regarding the Chrysler bankruptcy. Apparently, a very well respected bankruptcy lawyer has claimed that the "Car Czar" (fresh off from his latest pay to play meeting) told his firm that they had to accede to the agreement that gave majority control of the remnants of Chrysler to the unions. The White House has supposedly threatened to unleash their lap poodles (the White House Press) if the little old ladies who had invested in Chrysler bonds to fund their retirement didn't agree to accept basically ten cents on the dollar. (Why is it that Obama hates poor old retired people?) The White House of course has denied any such allegations in total. Which may have been the end of it, but the lawyer's client won't confirm or deny the allegation. Now, if it's just plain untrue, why not deny it? On the other hand, if it is true, wouldn't that invite the ankle biting press in anyway? It would seem to fit the expected pattern of using the courts to reward the Democratic constituencies that elected "The One." Very suspicious, but not yet beyond a reasonable doubt. But the lawyer has just filed a motion in bankruptcy court to stay the agreement since it is in essence an unconstitutional taking under the V Amendment. As Hot Air points out, you would think that our constitutional scholar/President would know that sort of thing. The current mantra espoused in the astroturf generated letters to the editor all seem to proclaim the general failure of capitalism. My question is, what would they replace it with? Socialism as a precursor to communism leavens the masses more effectively than capitalism, but does so by limiting individual performance. It restricts innovation and inventiveness and replaces it with government mandated rules and procedures. It still maintains an elite that get to decide who is rewarded or punished. And since these "elites" are human, they are just as vulnerable to human failings as capitalists, but they have much more power than capitalists have. Communism fails to answer the basic question of who will clean the sewers? If all labor has its dignity, who would prefer to muck out sewage instead of working in a clean lab? What model reduces inequality while allowing for individual excellence and fulfillment and at the same time maximizes individual freedom? There are no historical examples that I can think of that would accomplish this. PETA is going to stage a demonstration (if they get the permits) of a complete pig farm in front of the Capitol. I am sure that the irony escapes them.